The High Court has ruled in favour of the London Borough of Barking and Dagenham halting the Secretary of State’s decision to convert The Warren Comprehensive School into an academy against the wishes of local residents. 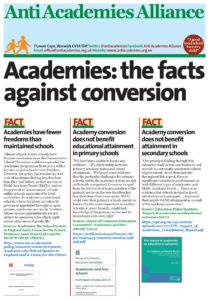 The monitoring of free schools and academies continues to cause misery for the DfE but more importantly for the children, parents and staff at Discovery – ordered to close less than two years after opening; at Al-Madinah described by Ofsted as chaotic; Kings Science Academy, Lincoln Priory, Barnfield … the list goes on. On 2 December the DfE refused a FOI request saying ‘recent press claims about the creation of regional regulatory bodies were speculation and based on out of date information’ , but just three days later adverts for the £140,000 commissioners appeared in the TES. 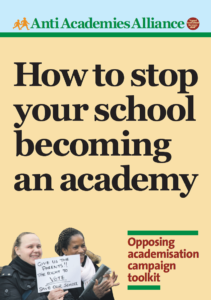 Labour to allow academies to opt into LA control? 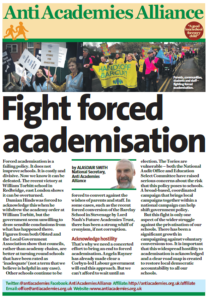 Posted in Blog, News, Top story	| Tagged Councils	| Comments Off on Labour to allow academies to opt into LA control? Roke – even the Tories think it’s wrong. Posted in News	| Tagged Consultation, Councils, Forced academisation, Gove, Primary	| Comments Off on Roke – even the Tories think it’s wrong.